Here is a quick overview of Italian peaks climbed in summer 2017. This may perhaps be the biggest challenge. 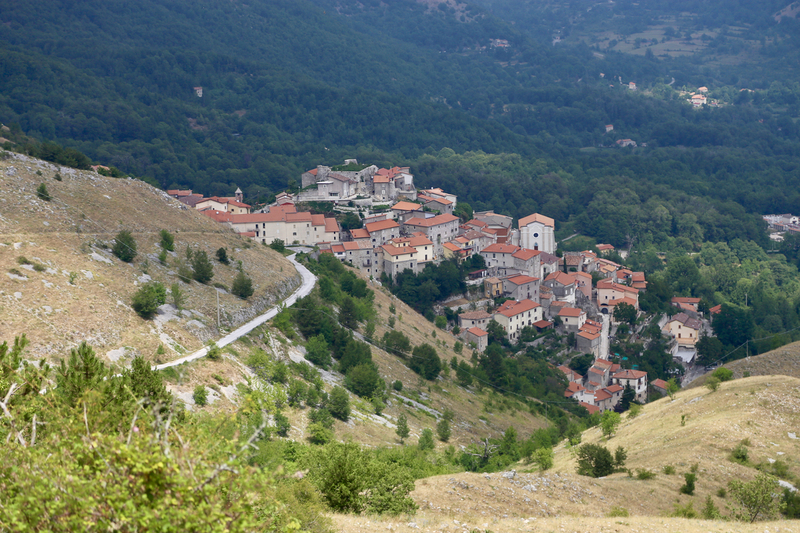 One need to travel to the very nice little village of Terelle. From autostrada A-1 (Rome - Napoli), exit at Cassino, pick up SR-630 and connect with SR-509. Hwy. SR-509, bends left and starts a climb up the valley. Exit to Belmonte Castello, this is near location N41.57540, E013.82679. Continue on SP-259 through Belmonte Castello and up the valley. About 2 kilometer after Belmonte Castello, there is a signed road going left, the sign says Terelle. This is at location N41.59288, E013.80171. The road to Terelle is a nice Italian country road. As you enter Tetrelle, the road makes a very sharp right turn, you will need to back up in order to get around it! Continue uphill on small roads through the upper part of Terelle, then pick up the road that climbs above town in hairpin curves. This road eventually forks at location N41.54594, E013.77645, elevation about 1110 meter. There is room for about 3 cars here without blocking the two roads. The left road is closed with an iron barrier. The right fork is rougher from here and a sign says that this is not a public road. In any event, this is a perfect trailhead. Park and prepare for a nice hike onwards. Continue along the paved road that runs left, ie. the one that has an iron barrier. Follow this road until it ends at a (closed) rifugio. From here, a big trail starts out, uphill just past the building. Follow this trail as it zig-zags uphill, the slope is very gentle indeed. You will pass a nice viewing point on a small rock (on your left). Higher up, make sure that you turn right in a place where the trail also continues ahead. Next, you will arrive at an information sign (you have passed several before getting here). Walk around this sign and pick up the trail heading more left on the upper side of this sign. (There is a false trail starting out just below the sign.) This trail climbs gently along the ridge on its left side. Higher up, one can easily loose the trail, however you are now on the main ridge and the terrain is easy to walk everywhere. 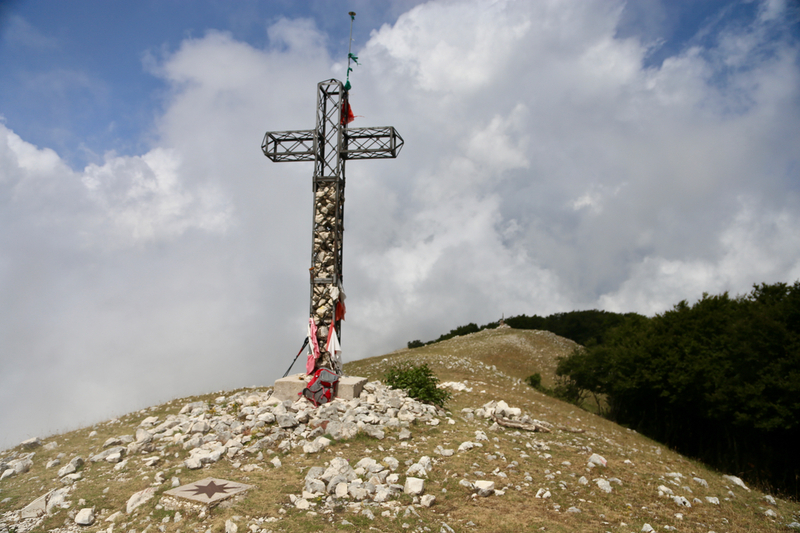 Shortly, you arrive at the summit cross and observe that there is a second summit perhaps 100 more meter ahead. 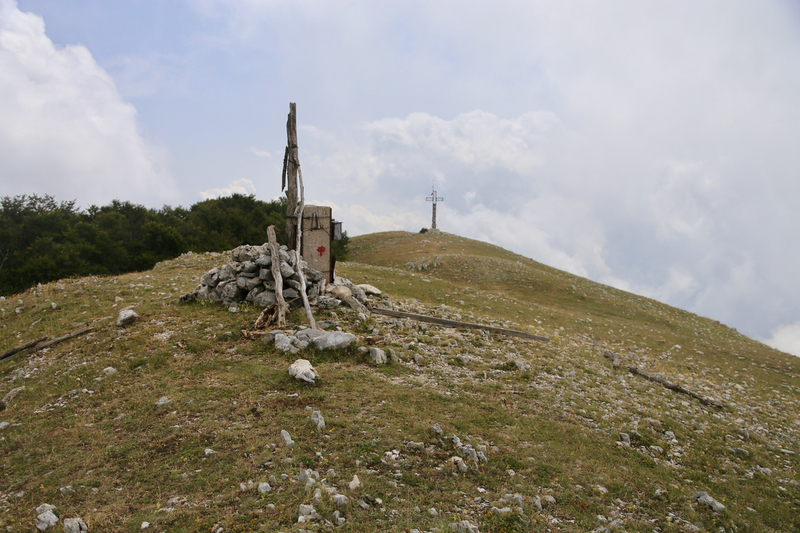 They are very similar in height and the second summit holds the summit register. 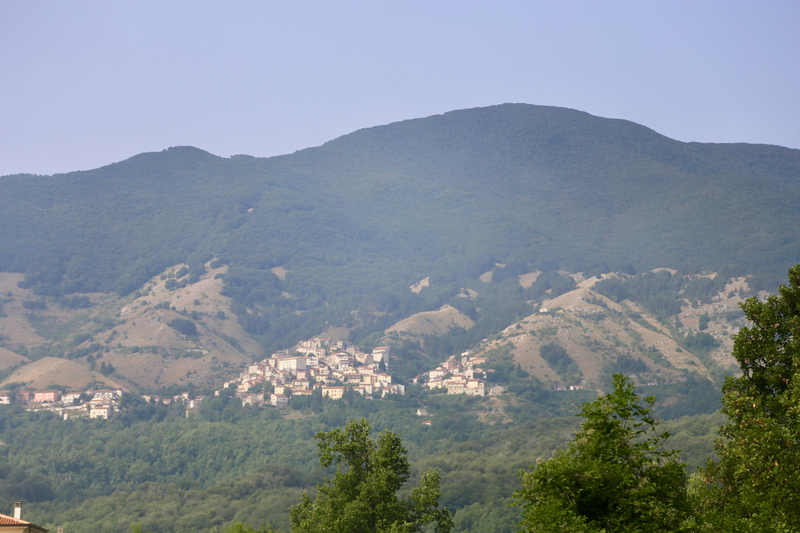 An interesting drive, several kilometer before getting to Terelle, I stopped and got a picture of Monte Cairo with the small town sitting there on the slope. It is fascinating to visit these small local villages that often have seemingly unlikely locations. I left the trailhead at 1020 and had a good walk along this nice, but never steep trail, arriving at the summit cross at 1125. 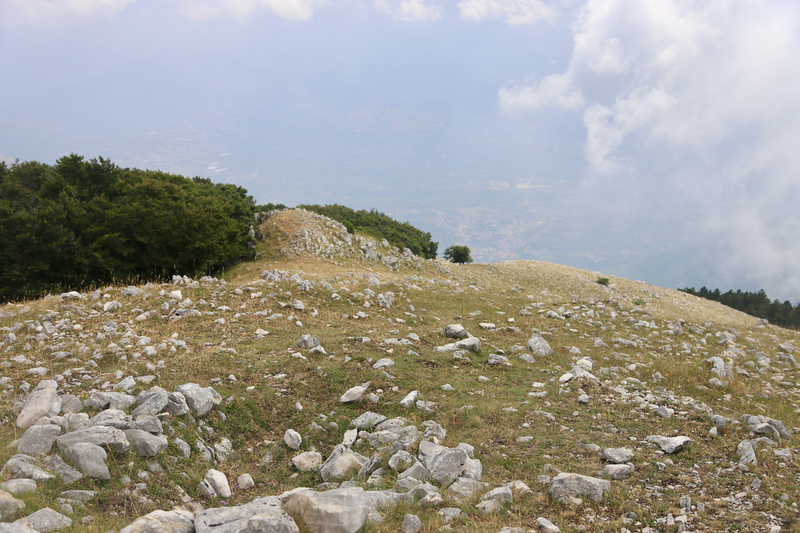 It was sunny at the summit, but the landscape below and around was obscured by clouds. I signed the summit register located at the competing point, only a minute away. Leaving at 1140, I had a nice walk back down the upper ridge, then along the same trail back to my car, arriving there at 1230, so 50 minutes for the descent. Monte Cairo, as seen from A-1.